Ferries pass in the long route between Ocracoke and Hatteras. Photo by C. Leinbach. The U.S. Coast Guard has officially made the Barney Slough—the longer, natural route between Hatteras and Ocracoke—an additional permanent waterway. The formal announcement was made Aug. 25 at a press conference in the Graveyard of the Atlantic Museum, Hatteras. 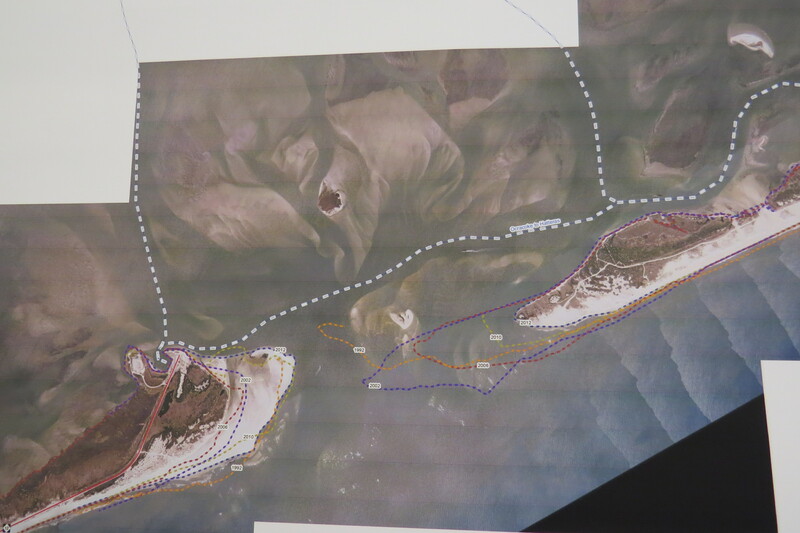 This route has been the primary route since December after the Rollinson Channel—the short route between the islands—became unnavigable. U.S. Coast Guard Captain Sean Murtagh, Coast Guard Sector North Carolina, stressed that the Coast Guard is not abandoning the short route because it is a federally-designated route and they must maintain it. “Funding for shallow draft inlets has been a problem since 2005,” added Bob W. Keistler, navigational project manager with the Army Corps of Engineers (ACE). Money to fund dredging from the Hatteras Ferry docks to the “gorge,” (which can move depending on the water) can only come from a Congressional appropriation, he said, and hiring the pipeline dredge would cost $1 to $2 million. Jed Dixon, ferry division deputy director in Manns Harbor, discussed two charts of the inlet showing the heavy shoaling as well as the erosion of the end of Hatteras Island, which still is occurring. If the inlet could be dredged and the “spoil” deposited at the end of Hatteras Island, it would help keep ocean water from flowing into the channel, noted Warren Judge, chairman of the Dare County Commissioners of which Hatteras is a part. Hatteras charter boats still use the short route through which they have found deep enough water and marked these spots with Clorox bottles. With the short Rollinson Channel route the ferry division typically ran four ferries, said Ed Goodwin, ferry division chief, but with the longer route, they have been running six ferries, though each can only make five trips per 12-hour shift. “It costs the ferry division $7,500 a day to run boats in the alternate channel,” he said. While many islanders are thankful that at least this route is available, many others declined to talk on the record that they are upset with the loss of the short route. Rudy Austin, Ocracoke Civic and Business Association president, said at the Aug. 13 meeting that last year, the short route began July 15 and business on Ocracoke picked up. This year, some businesses are reporting about half of the customers than they usually see, Austin said. July ridership statistics provided by Tim Hass, ferry division spokesman, show that both cars and passengers on the Ocracoke-Hatteras route was down by 24 percent from last year with 37,572 vehicles and 112,204 passengers. “(Having the long route) is really affecting our north-sound traffic,” Austin said. It also affects the time islanders spend to go up the beach for doctor’s appointments and other errands as well as vendors supplying goods and services. Heavy shoaling began in 2011 with Hurricane Irene and got worse with Super Storm Sandy in October 2012. While the U.S. Army Corps of Engineers did some dredging with the pipeline dredge in early 2013, that work was incomplete and short lived. During that time, the Coast Guard approved use of a natural channel which runs farther east in the Pamlico Sound. The long route takes about an hour and the short route has historically taken 40 minutes. The state continues to do periodic dredging with the side caster, but that does not go into the federal channel. While the Ferry Division is challenged to do something about the long wait visitors may have at the Hatteras docks, sometimes the wait keeps people on Ocracoke longer, noted Sean Death, manager of the Ocracoke Gas Station. This graphic shows the erosion of the south end of Hatteras Island with the blue line indicating where the island was more than 20 years ago. 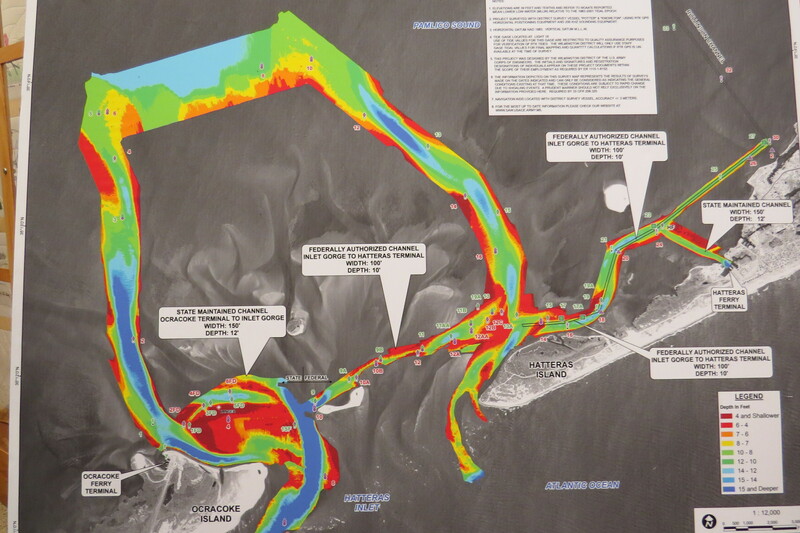 This graphic from the NC Ferry Division shows the relative water depths in the Rollinson Channel (short route) and the Barney Slough, the natural channel in the Pamlico Sound that the ferries have been using since December.